Oketo town, which is located east to the Taisetuzan mountains in Hokkaido, has been known for its forestry and agriculture after separated from Notsukeushi village (present Kitami city) in taisho era. In 1983 a wooden craft Oke-craft was born, which use Japanese Yezomatu tree grown up in nature, and developed as a local indusry. Oke-craft is not only easy to handle, has warmness of handmade and has a simple taste but also use unsymmetrical core hard wood which are not suitable for construction and not valuable. While only on the surface similar attempt are taken in other area and a commercialized north European modern design is getting popular, it has never been influenced by them. This attitude should be admired. 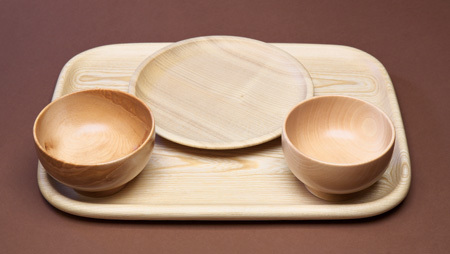 Wooden school lunch plates shows visually how Oke-craft's spirit return to the local area (primary and secondary school) and is a good nutrition education and industry promotion project. Children who carry the next generation enjoy good food on good plates and think about crafting and environment. Furthermore, improving the old school lunch plates, which were no design or bad design, to a universal industrial product and the making a clear difference from the approach to apply traditional craft plates without any improvement are the extraordinary points. Needless to say that the strength of the plate and hygienity are also considered and the attention from the market onto the expansion of the plate to home use is high.